If pressed to give a date to the start of this year’s fall migration, I would choose Aug. 20. It’s the day I finally added a new bird to my 2015 yard list after being stuck at No. 59 since June 2 when I heard a Yellow-billed Cuckoo calling from the woods behind my house. Needless to say, the months of June and July had not been very productive for adding new species to my list. Yard Bird No. 60 turned out to be a White-eyed Vireo, which is not a summer nesting bird in my yard. Migrating White-eyed Vireos have often made visits in the past, so I was glad to welcome this species and add it to my list. Photo Courtesy of Roy Knispel The White-eyed Vireo gets its name from the white iris of its eye. On the same evening I observed the vireo, I also watched Ruby-throated Hummingbirds chase Blue-gray Gnatcatchers through the thin branches of a dead spruce tree. I also took delight in observing a family of Northern Cardinals — father, mother and two young birds — visit the feeders. Known by the scientific name, Vireo griseus, the White-eyed Vireo is a member of a family of songbirds with several species that make their home in the region. This vireo gets its common name from the fact that it does indeed have white eyes. Unlike some of its treetop-dwelling relatives, the White-eyed Vireo prefers to stay close to the ground in thickets and dense shrubbery. I often find these birds in the same habitats favored by such birds as Yellow-breasted Chat and Brown Thrasher. Like these larger birds, the White-eyed Vireo is a very vocal bird. The security of thick, inaccessible brushy habitats must give these birds, which are only a little more than five inches long, the confidence to go about their lives in a brash, noisy manner. The term “vireo,” originating in Latin, can be translated into English as “green bird.” It’s an apt description, as many of these small birds are primarily dull green in coloration. 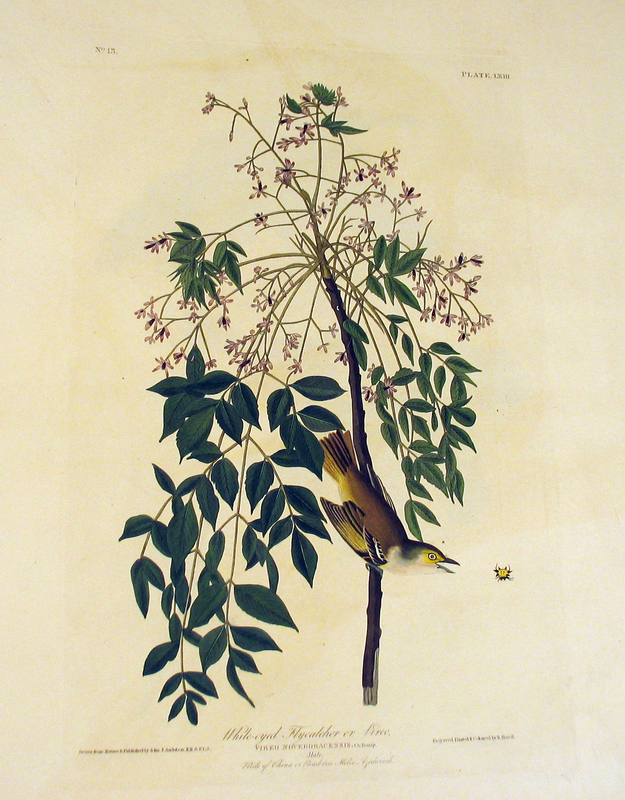 The White-eyed Vireo adds some dull yellow, gray and white feathers to the mix in a distinctive pattern that should easily separate this bird from other vireos. White-eyed Vireos spend the summer nesting season in the eastern United States south of a line extending from eastern Nebraska across Indiana and New York. Each fall, they retreat to spend the winter in locales ranging from the extreme southeastern United States through Central America. 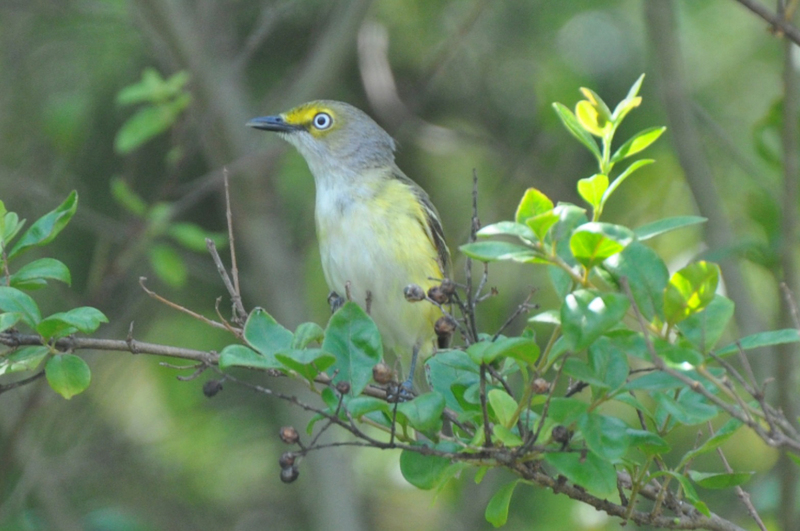 Some of these vireos also winter on Caribbean islands such as Cuba. 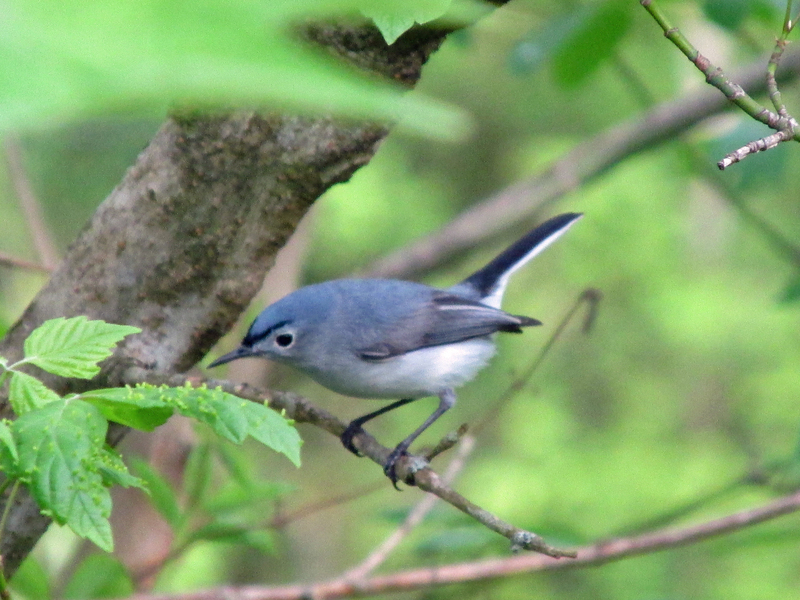 Photo by Bryan Stevens Blue-gray Gnatcatcher have been abundant again, another sign of the approaching fall migration. To learn more about birds, birding and other topics from the natural world, be sure to friend Bryan Stevens on Facebook at https://www.facebook.com/ahoodedwarbler. He is always posting about local birds, wildlife, flowers, insects and much more. If you have a question, wish to make a comment or share a sighting, email him at ahoodedwarbler@aol.com. 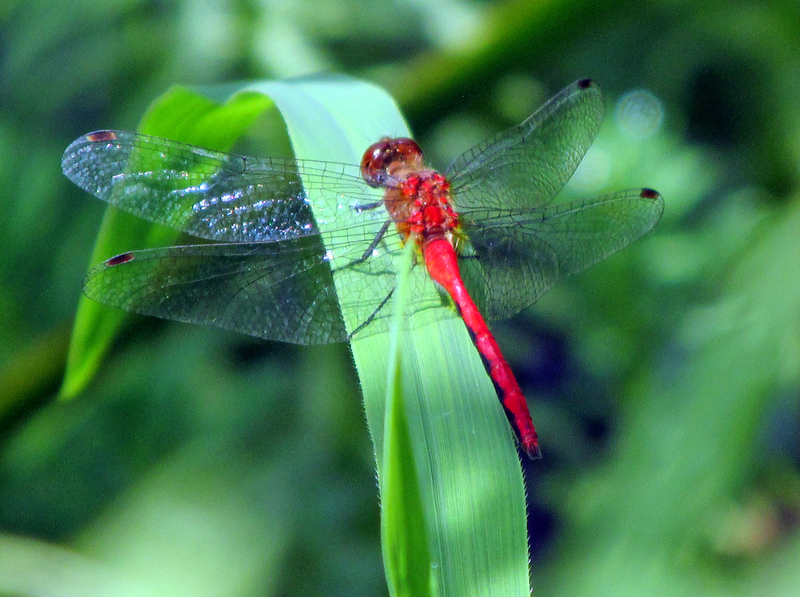 Photo by Bryan Stevens A dragonfly sighting that turned out to be a Ruby Meadowhawk is another sign that the fall migration season is at hand. 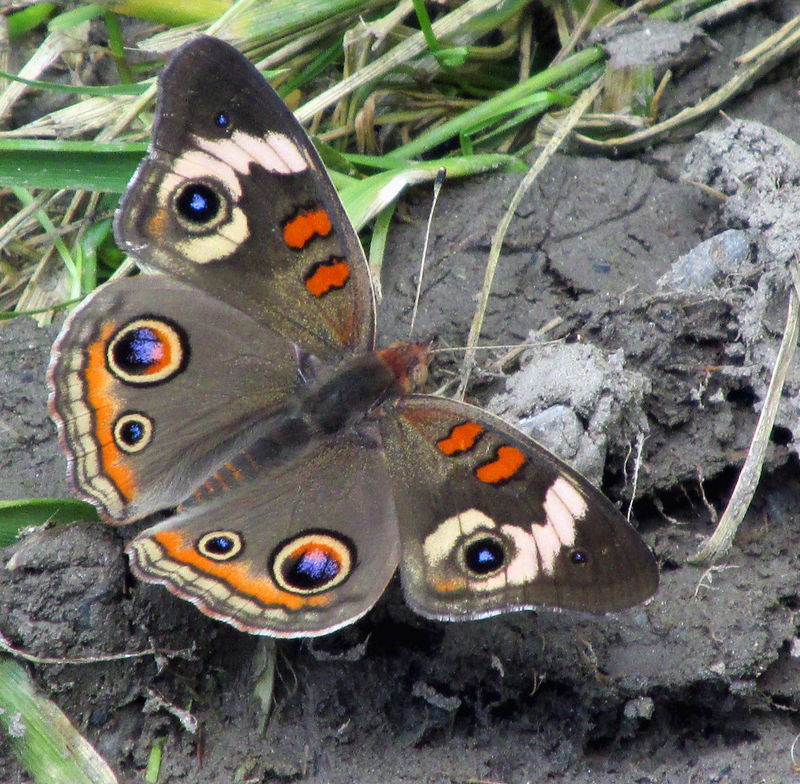 Photo by Bryan Stevens A Common Buckeye seeks nutrients in damp mud on a recent August afternoon. This entry was posted in Big Year, Birding, Birds, Vireos, White-eyed vireo and tagged Birding, birds, Bristol Herald Courier, Carter County Compass, Elizabethton Star, Erwin Record, Feathered Friends, McDowell News, Our Fine Feathered Friends on August 22, 2015 by Bryan Stevens.